Looking forward to an update. We're in the market to buy a cargo bike, preferable a front loader. The UA seems like a good choice for the not so handy so we won't have to jimmy rig anything. I'd love to know how it handles a decent slope, say 8% or more. We're moving from flat Perth, Australia to the Pyrénées but are desperately hoping to keep our cargo bike lifestyle! PS we currently have a Gazelle Cabby but even being optimists know that it just won't cut it in the mountains. I'm hoping the UA will get us up the 2km, 8% road from the valley. 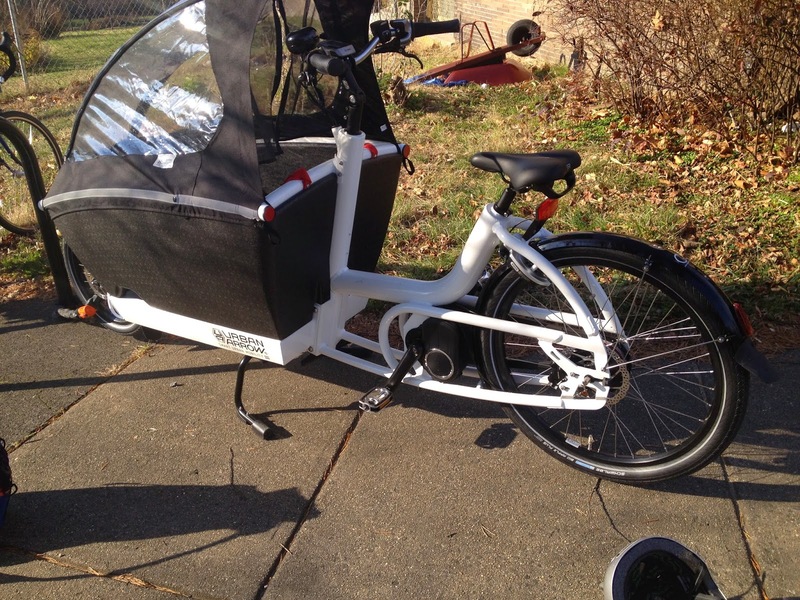 Thanks for sharing such informative review of 2015 urban arrow. It's really good to know the bicycle is I'm about to buy performs fantastic. Looking forward to read the full review of this bike before purchase. I have read a few of the articles on your website now, and I really like your style of blogging. I added it to my favorites blog site list and will be checking back soon. Please check kids balance bike out my site as well and let me know what you think. Congratulations for your blog which is very instructive and fun to read! - wether my boy will quickly outgrown it (he is quite tall)? - wether the seat appropriately cushion road irregularities (very present in our town)? - wether the seat is confortable enough for long rides (say 1 hour or 2 in a row) and if it's easy for kids to fall asleep in it? The bike is lighter then this 2013 version. I was told with the UA's designer the aluminum and hardening process vary then the original so the motorcycle is lighter and rigid. They look bright but my last ones ended up even brighter. They do still get standing lights. I also like the best way to turn the lights on from the reader but hub lights which are always on is just awesome pertaining to forgetful people like me. The tires are big apple+ they're so far so good. The front wheel about this bike is quick release, which created my head hurt. I sometimes like my bike by the front wheel so will have to put skewers in it.